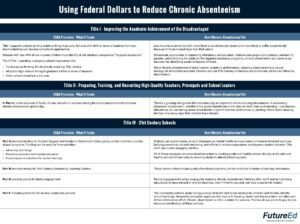 Title II, which pays for professional development for teachers and staff, specifically mentions chronic absenteeism as a topic for in-service training. Title IV provides $1.1 billion for Student Support and Academic Enrichment grants, a block grant program with priorities that include ensuring safe and healthy students. That can pay for improvements to health services, family engagement and school climate, all of which influence attendance. The title also supports 21st Century Learning Centers, Community Schools, and other programs that have proven successful in tackling chronic absence. Find the full blog post, and an easy to read table, on the Future Ed website.